Retail signage is so important because the science of retail has proven humans are very lazy when we shop. In most cases if we have to wait to ask for a price, directions, or information; we’ll just walk away. Imagine how many sales you lose due to the lack of professionally printed signage that will work in your absence? Below are my “must haves” to make your pet retailing a success! How many times have you been in a restaurant or store that you’ve entered and look around to find the name of the business is nowhere to be found? This is a lost opportunity for store branding! Remember that you want your store logo/company name EVERYWHERE because you want your client to remember your store and tell their friends. For at least 130 years, there have been studies written on how many times it takes for a person to start remembering a company, slogan, or advertisement which is also known as “effective frequency.” The general consensus is that it takes somewhere between 6-20 times for effective frequency to kick in so that the client remembers the message you are trying to convey! Make sure your branding is on the outside of your store, the inside of your store, your website, your social media, your rug, your price tags, your uniforms, and anywhere else you can think to display! There are many salons that have very bare front windows because they think they can’t “afford” the additional cost. Trust me you cannot afford NOT to have that store front signage! Your front store windows should very quickly convey what you do, what you sell, your store name, hours, and contact information. To ensure my marketing is working while I’m home at night… I leave my front chandelier lights on so people can see inside and want to return even when I’m not there! As you build your retail clientele, you will attract shoppers that are unfamiliar with your store. If they pop in looking for a collar or leash, make sure you have signage for that department. Although it’s important to greet your clients in a professional retail environment, department signage can save you and your client time. 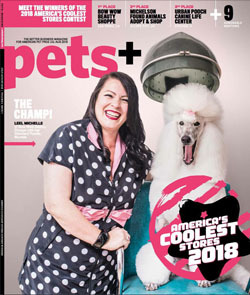 Additional departments that are common in the pet retail sector may be toys, grooming supplies, clothing, food, treats, harnesses, supplements, travel, birthday, and more. Remember to keep your signs professional, simple, and uniformed. You don’t have to buy them all at once but remember to keep them uniformed for future department expansion. Having a well thought out clearance department in the back of your store is great to get rid of seasonal left overs or the 1-2 items that are left over from a recent purchase. Make your signage clear as to what the new prices are so you don’t have to tell them over and over again. Example: “Clearance: Everything 50% off original price.” This lets them know how much off of “what” price. Yes, there are many stores that do not have prices on their retail merchandise. Invest in a point of sale system or (POS) along with a bar code reader and printer. This will make your life so much easier! A POS also makes you look more professional. If you are grouping a large selection of items together in the same department with the same exact price, then a larger sign or “price point” will help move that selection as well because it calls attention to the “opportunity” you are giving the client to own that item. When a client walks into your business, do they know where to drop off, pick up, get their purchases calculated? Sometimes a simple “Start Here” or “Purchase Here” sign hanging from the ceiling will save you and your staff a lot of time. If you have a treat bar, do they know where to get bags to fill up with treats? Is it calculated by piece or weight? Walk into your store from outside as a new customer and see if the flow of your space is immediately recognizable. If you cannot change the flow then add a sign and you’ll be amazed at how much easier it will be for you, your staff, and your clients! Many salons miss out on retail opportunities all together because they don’t want to “deal” with the extra time and attention retail clients require. If your retail selection is well merchandised with professional retail signage, your signage will act as a professional, unpaid employee! You can add a revenue stream while still grooming with little effort every day. I hope this helps you increase your retail success!